While state dinners have a long tradition, the first head of state to be honored with one at the White House was King David Kalakaua of Hawaii on December 12, 1874 by President and Mrs. Ulysses S. Grant. When President Xi Jinping attends the state dinner for him on Friday, China will become the only country to have the honor twice under the Obama administration. A State dinner for the British High Joint Commissioners in 1871 illustrated by Frank Leslie’s Illustrated Newspaper. Image credit: The White House Historical Association. The State Dining Room in the Grant administration after the installation of massive gas chandeliers in 1874. Credit: National Archives. A State dinner during the Cleveland administration for diplomats in 1889 showing the long table, the splendor of the decorations, illuminated by gas chandeliers that seated sixty at that time. Credit: The White House Historical Association. King and Queen Prajadhipok of Siam at the White House for a state visit with President Hoover, April 30, 1931. Credit: National Archives. Seating arrangements for the state dinner for George VI of the United Kingdom, hosted by President and Mrs. Franklin D. Roosevelt on June 8, 1939. Credit: National Archives. President and Mrs. Truman and President Eurico Gaspar Dutra of Brazil at a state dinner, September 5, 1947. Credit: National Archives. National Park Service, The White House. State Dining Room redecorated after the Truman Renovation as it appeared set up in 1960 for a dinner for the King and Queen of Denmark. Credit: The White House Historical Association. President and Mrs. Eisenhower at the state dinner for President and Madame de Gaulle of France, April 22, 1960. Credit: National Archives. President and Mrs. Kennedy host a state dinner at the White House welcoming Prime Minister Jawaharlal Nehru and his daughter Indira Gandhi of India, November 7, 1961. Credit: John F. Kennedy Library. The State Dining Room in 1962 after the Kennedy redecoration. Credit: The White House Historical Association. Madame Zhuo Lin, First Lady Rosalynn Carter, Vice Premier Deng Xiaoping, and President Jimmy Carter at the arrival ceremony for the Vice Premier of China at the White House on January 29, 1979. Credit: The National Archives. President Ronald Reagan and First Lady Nancy Reagan with President Li Xiannian and Madame Lin Jiamei of the People’s Republic of China on the North Portico before a State Dinner on July 23, 1985. Credit: Ronald Reagan Presidential Library and Museum. State dinner for President Kenan Evren of Turkey, hosted by President and Mrs. Reagan in the Rose Garden, June 27, 1988. Credit: National Archives. Guests seated with President George H.W. Bush and Queen Elizabeth at a state dinner held in the Queen’s honor, May 14, 1991. Credit: George H.W. Bush Presidential Library. The State Dining Room, 1991. Credit: The White House Historical Association. Table Setting and Decoration for the State Dinner of President Jiang Zemin of China hosted by President William J. Clinton and First Lady Hillary Clinton. Credit: William J. Clinton Presidential Library and Museum. President Barack Obama and President Hu Jintao of China watch the United States Army Old Guard Fife and Drum Corps pass on the South Lawn of the White House on January 19, 2011. Credit: Official White House Photo. 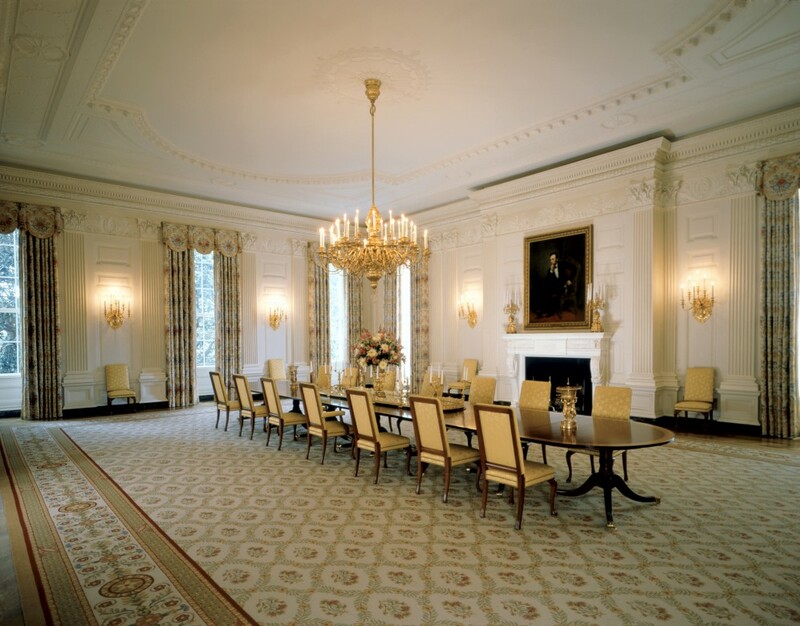 The State Dining Room after refurbishment in 2015. Credit: The White House Historical Association. A table setting for the state dinner Sept. 24, 2015 with President Xi Jinping and first lady Peng Liyuan of China. Credit: Jessica Stone, CCTV America.